A) Church of Santa Marìa della Concezione: The walls and roofs are “decorated” with the Cappuccini Friar’s bones. Offer: €1. Where:Red Metro A: Barberini, take the Via Veneto exit and find the number 27. B) Spanish Steps: It was called after the king Ferdinand the Catholic, who gave the construcciòn of these steps as a present. C) Piazza Navona: one of the most famous piazzas of Rome and the whole world, due to the beauty of the sculptures, fountains and churches in it. D) Pantheon: Circular temple built in the beginning of the Roman era, dedicated to all the gods, it is also known as La Rotonda, because is placed in this piazza. 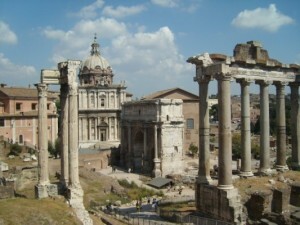 This is the onlypagan temple of the antique Rome that has survived intact. E) Trevi Fountain: Don’t forget to throw a coin above your shoulder if you want to come back to Rome. Another legend assures that if you throw 2 you’ll have a new romance, with 3 you’ll get married. G) Campidoglio: When a tourist see a photo of this piazza, it is said that he or she will immediately identify it as roman. The Capitoline is also one of the 7 famous hills of the city. H)Roman Forum: If your budget doesn’t allow you to buy the ticket you can walk along Via dei Fiori Imperiali, you can admire it anyway. If you are in the Campidoglio, walk behind it and you’ll get to the beggining of the street. You will have the Colosseum in front of your eyes so don’t miss your camera. I)Constantine’s Arch: One of the most old arches of the Roman Empire. J)San Clemente Church: It has 3 levels, the lowest has a pagan altar, the second has a cristian basilica and in the superior level you can admire the middle age frescos. Certainly there are other things that can be admire for free, among them: Saint Peter’s dome, the Bocca della Verità, the Storical Museum of the Roman Liberation, apart from the rest of the piazzas and public parks as theVilla Borghese. Don’t forget to check this map! I can give you an advice if you you like photography, and you are in Rome for a few days… Do you want take the best pictures in Rome during your journey? The standard photo tour is a unique photographic experience! You will be with a professional photographer, expert in reportage and landscape, for find the best pictures, listening his advice and walking in the better neighborhoods for original and beautiful pics. service available for half day and all day.